Roasted Butternut Squash. Sage. Citrus. Super Food. When it comes to vitamin A-packed orange produce, I'm a year round sweet potato and carrot lover. But when fall hits, seasonal peer pressure kicks in and I can't resist the bountiful offerings of squash. 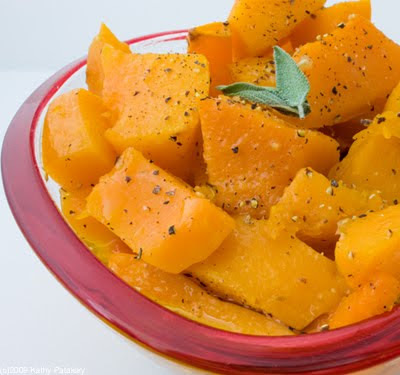 Butternut Squash is my favorite, it always warms me up from the inside out. 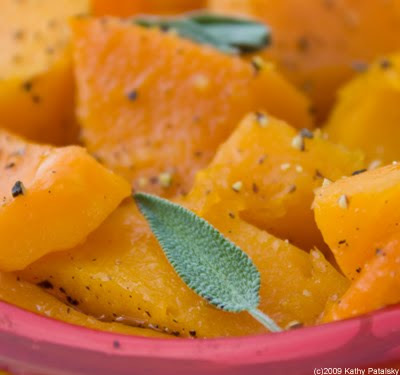 My Sage Citrus Roasted Butternut Squash recipe is a classic crowd-pleaser. 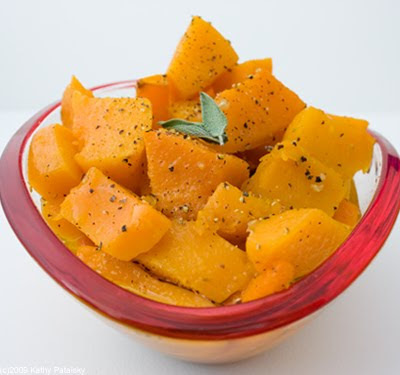 I crave butternut squash for its sweet flavor and tender, moist texture. Butternut Squash Nutrition Facts. 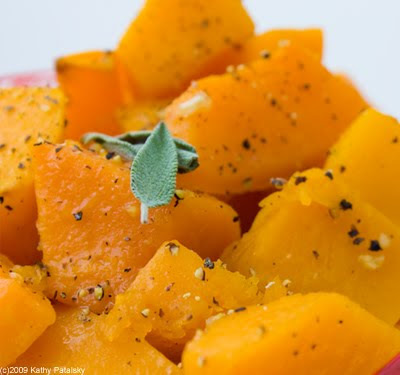 Butternut squash is super high in vitamin A. It is also a good source of fiber, vitamins B6, C and E, potassium, manganese and magnesium. It is fat free and contains about 80-100 calories per cup of cubes. Super food approved! *averages 150% RDA, but will vary by each squash. 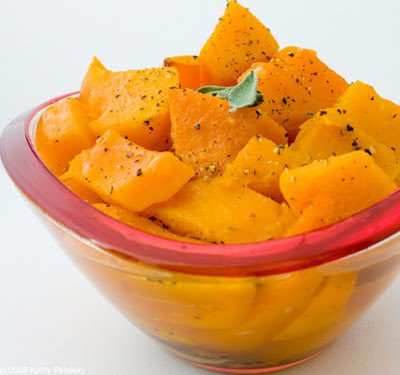 Some sources note up to 450% RDA in one cup of cooked squash. Ingredients Note: I did not include ingredient measurements because each squash is sized differently and each person will want to prepare their squash "to taste" using my basic ingredients. I will describe ingredient uses in directions below. 3. Drizzle a bit of EVOO in the bottom of a large casserole dish. Tear a few (4-6) sage leaves and place them in the bottom of the dish as well. Place the pre-cut squash cubes in dish. Swirl them around in the oil a bit. For whole squash, place squash halves in dish, flesh side up. 4. Squeeze fresh juice from one orange and drizzle it over top the squash. About 1/3-1/2 cup of juice. 5. Drizzle about 1-3 Tbsp of maple syrup over squash (depending on how sweet you want it and the squash size. 6. Drizzle about 1-3 Tbsp of olive oil over the squash, again depending on how decadent or how light you want your squash to taste. 7. Drizzle a small amount of apple cider vinegar over the squash. About 1 Tbsp. 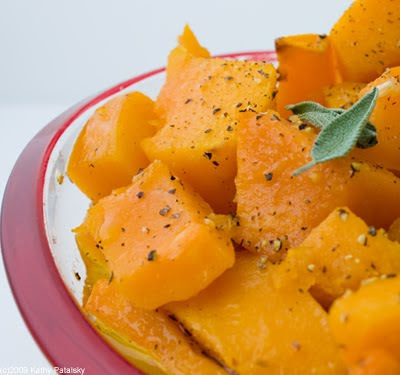 Note: not all the oil/juice/syrup/vinegar will be absorbed by the squash, but rather it is used as a heating liquid and flavor-adding ingredient in the bottom of the pan. 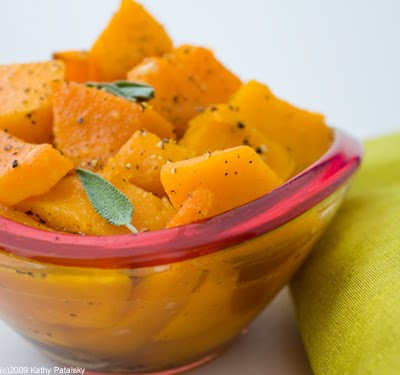 With it, you will be left with a lovely squash drizzle sauce for your end result dish. 8. 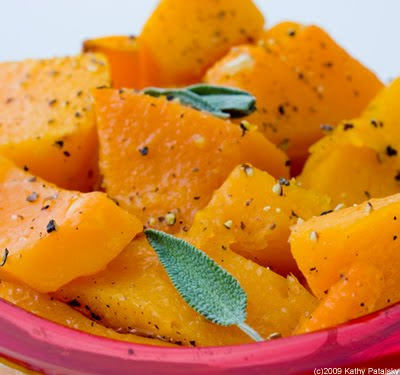 Sprinkle salt/pepper on top of squash flesh, to taste. Add optional cinnamon and/or dash of cayenne here as well. 9. If using whole squash halves, you can now flip the halves flesh side down so they soak in the liquid ingredients while roasting. 10. Cover dish lightly with foil-air vent. Place in 400 degree oven for 25 minutes. After 25 minutes are up, remove foil, turn oven to broil and lightly stir squash cubes. If using real squash, you can baste it in a bit more of the sauce sitting in the pan. Broil on high for 5-7 minutes, or until top starts to caramelize. Do not let broiler 'dry out' your squash. Watch it closely. 11. Remove squash. It should be tender and easily breakable with a fork. Allow whole squash halves to cool 15 minutes before scooping or slicing out the flesh. 12. Serve in a bowl with a drizzle of the baking juices. Garnish with fresh sage leaves and pepper.